Mangos, mangos and more mangos, a delicious recipe. The Axarquia in Andalucia where La Rosilla is situated has become over the last few years the perfect location in the lowlands along the rivers to grow Mangos. The subtropical climate in the area is ideal for these luscious fruits. They hang from the trees heavy and blushing. When picked they are firm, with an olive green skin and then they ripen slowly to deep purple and russet. The yield in golden, juicy flesh. Mangos can feel quite tricky to peel and stone, as they have a large oval stone running the length of the fruit. There are many videos online to get the tips – HOW TO PEEL AND CUT A MANGO. Here on many roadsides there are fruit sellers, selling the abundance of their freshly picked crops. One can get as many as 10 Mangos for 5€ !! I was fortunately given a huge basket load, some perfectly ripe, some nearly, some just over. The over-ripe mangos I either freeze the flesh for Smoothies or puree for a coulis over ice cream. The perfectly ripe I will use in salads or for a fresh breakfast, check out my Mango Brunch recipe here. This recipe I have used over the years is from Jamie Oliver, I adapt it slightly to use the spices I have to hand, the amount of sugar and vinegar in my larder. As it bubbles away on the stove, I prepare my jars by sterilising them in a hot oven for 10-15 mins. 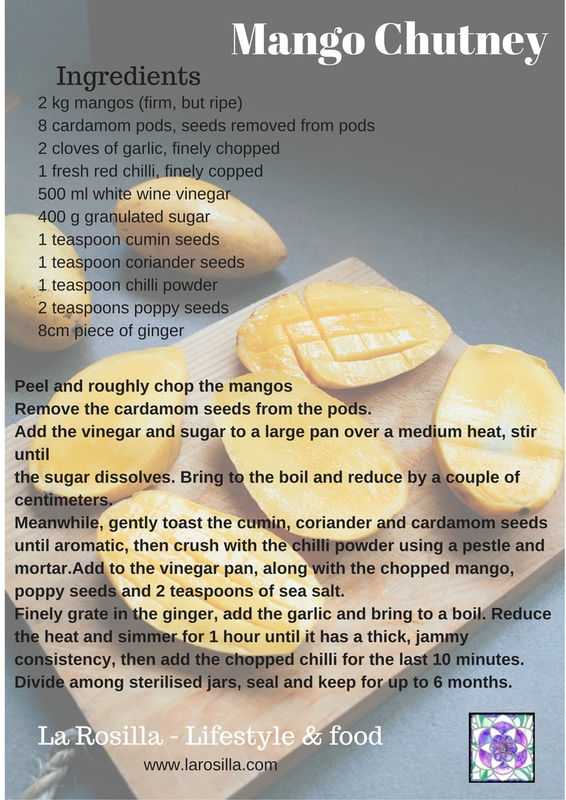 Mango chutney is perfect side dish for curries, poppadoms and bhajiis, I like it ontop of cottage cheese, or a baked brie and bread for dipping. This chutney will keep for up-to 6 months in a cool dark cupboard, once opened keep in the fridge. A jar of chutney would make an ideal home-made gift for Christmas as part of a hamper.